Major league baseball across the country adds more “Bark in the Park” dog-friendly baseball games to their schedules each year. For these special events, a section of the stands is reserved for people and their dogs. Bark at Oriole Park: May 29 and Sept. 10. This year’s White Sox Dog Days will take place on April 29 (vs. Baltimore Orioles) and September 10 (vs. Kansas City Royals). Enjoy the fun of Bark in the Park presented by Rachael Ray™ Nutrish®, Milk-Bone® and Kroger all season long and save along the way! The four (4) game Bark in the Park Season Pass will be $160 total and include one (1) DOG ticket and one (1) HUMAN ticket to each of the four (4) BITP games throughout the year.Bark in the Park dates: Redsvs. Atlanta Braves – April 25; Reds vs. Chicago Cubs – May 14; Reds vs. Houston Astros – June 17; Reds vs. Philadelphia Phillies – Sept. 3. Colorado Rockies vs Arizona Diamondbacks, Tuesday, August 13 at 6:40 PM. The Colorado Rockies are proud to announce the annual Bark at the Park on Tuesday August 13, presented by AvoDerm Natural Pet Foods and Nylabone. Dogs and owners alike can partake in the fun and festivities as the Rockies take on the Arizona Diamondbacks. With each paid human ticket one dog is allowed in for free. Special event tickets, proof of vaccinations, and signed waivers are required for participation. This event will sell out as seating and tickets are extremely limited so reserve your spot today! The Detroit Tigers are excited to bring back ‘Bark at the Park’ for three games in 2019: May 21, June 25, and Sept. 16. This special event will allow Tigers fans and their dogs to enjoy a game at Comerica Park. 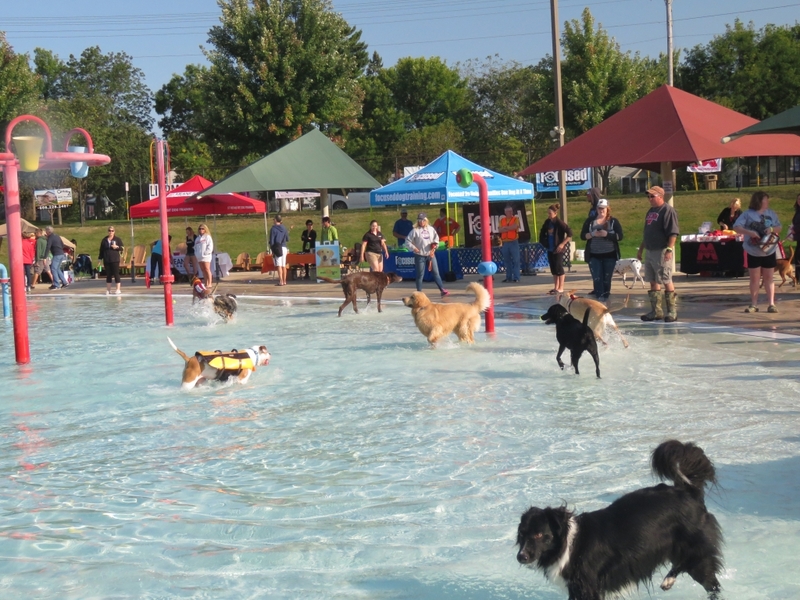 A portion of the proceeds from this event will go to the Michigan Humane Society. Bring your Astros Rally Pup to enjoy the game at our annual Dog Day, presented by Tito’s Handmade Vodka, at Minute Maid Park on Sunday, August 25th. Your pup will love watching the Houston Astros take on the Los Angeles Angels at 1:10 pm and can participate in fun, unique Dog Day activities such as a costume contest, pregame parade around the field, and more! The Kansas City Royals are excited to host Bark at the Park again in 2019! This year’s three events will be held on April 29, May 15 and September 4. Bark at the Park gives you the chance to sit beside your canine friend while taking in an evening of Royals baseball. Please note that you must pre-register through this page to attend Bark at The Park or to bring your dog into the stadium. Bark at the Park presented by Tito’s Handmade Vodka. Four dates: April 14, June 9, July 14, August 11. Tickets, which are $16 for humans and more importantly $10 for dogs, include a $5 donation to the Humane Society. 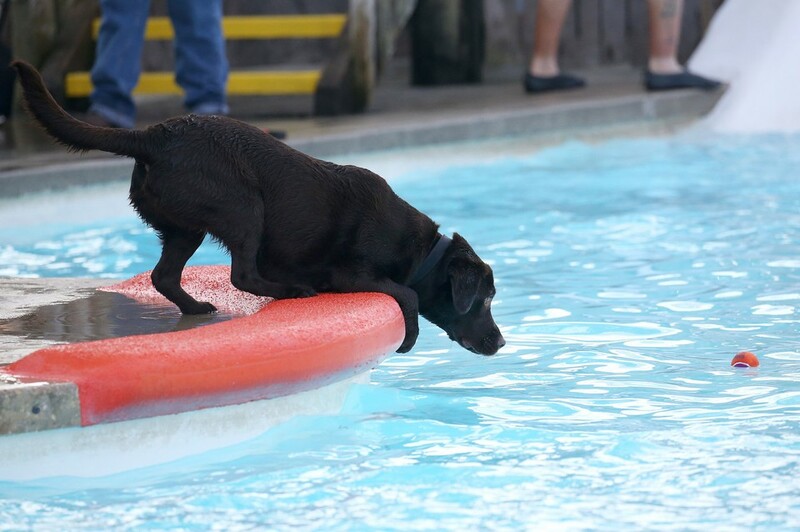 They say you can’t teach an old dog new tricks, but we’re fairly certain that any pup can learn to love the Crew. And by locking in a special Bark at the Park ticket package, you can bring your four-legged friend to the ballpark to cheer on the Brewers against the Braves on Tuesday, July 16. This special ticket package also features a Brewers rope-style dog toy. As an added bonus, a portion of all special ticket packages sold will benefit the Wisconsin Humane Society and Animal Rescue Foundation. Join the Mets and North Shore Animal League America for Bark At The Park at Citi Field! Bring your canine companion and support the largest no-kill animal rescue and adoption organization in the world.Sit together with fellow dog lovers in designated Coca-Cola Corner seats. A portion of the dog ticket and of the human ticket will benefit North Shore Animal League America. Dogs will only be allowed in the Coca-Cola Corner at Citi Field.Bark at the Park dates: Mets vs. Washington Nationals – May 21; Mets vs. Miami Marlins – Sept. 26. Friday, June 21 vs. Rays at 7:07 p.m. The Coliseum goes to the dogs on Friday, June 21. 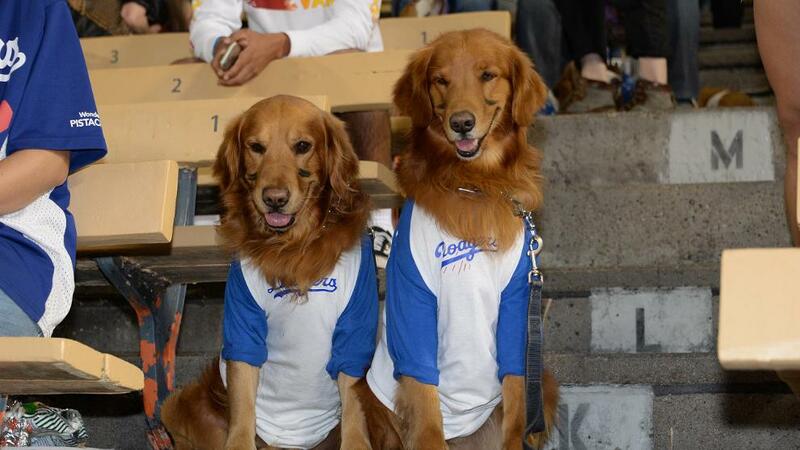 All pups are invited to come out the ballpark on this special day, presented by AvoDerm Natural & Nylabone. Human and dog tickets must be purchased separately. 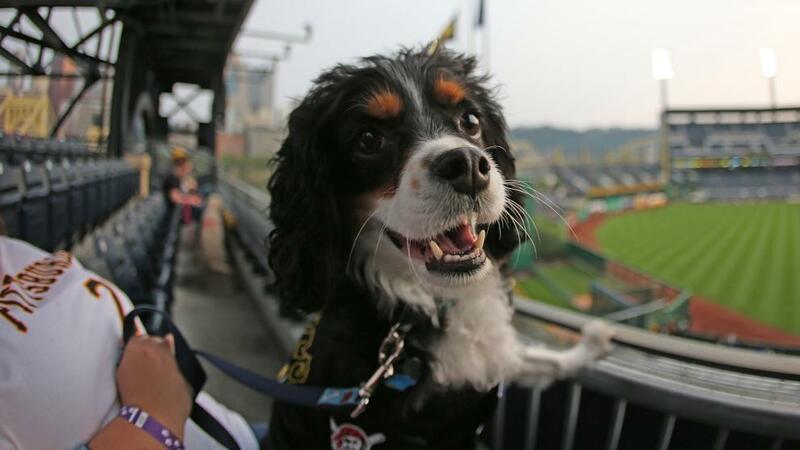 Bring your Pup to the ballpark EVERY Tuesday home game in 2019! Bark at the Park | Tuesday, April 16 vs. Rockies. Join the Padres for Bark at the Park on April 16! Bark at the Park gives you the chance to sit with your favorite canine while enjoying a Padres game! Your Theme Game package includes a limited-edition Padres-themed collapsible pet bowl and a ticket to the Rockies vs. Padres game. All tickets for this event will give you and your dog access to the Bark at the Park area in Park at the Park. Limit four (4) tickets per customer. Online purchases only. Padres Advance Ticket Window or walkup purchases will not be allowed even for approved dogs. Calling all the Good Boys and Girls for a night of new smells, a walk around the bases, and lots of t-r-e-a-t-s. Plus, all pups receive a limited-edition Bark at the Park Mariners themed-giveaway with this offer. Bark at the Park dates: Mariners vs. Texas Rangers – May 28; Mariners vs. Texas Rangers – July 22; Mariners vs. Cincinnati Reds – Sept. 12. On Saturday, May 25th, the St. Louis Cardinals host the 15th Annual Purina Pooches in the Ballpark. The purchase of a special ticket will grant you and your pooch the opportunity to enjoy the game in pet-friendly sections of the ballpark. You and your pooch are then invited onto the field to participate in a pre-game costume parade around the warning track. Pets are encouraged to show their Cardinals pride by wearing weather-appropriate team gear or their best summer-inspired costumes for a chance to win prizes and unique opportunities courtesy of Purina and the St. Louis Cardinals. Dog Day at the Rays is Saturday, June 15 at 1:10 vs. Los Angeles Angels. The Tampa Bay Rays invite you and your puppy pal to Dog Day at the Rays at Tropicana Field when the Rays take on the Los Angeles Angels! For just $30 ($40 value) this specially priced ticket package includes a seat for you and your best pal in the GTE Financial Party Deck and a Rays Dog Day themed item. Texas Rangers vs. Toronto Blue Jays. Bring your dog to Globe Life Park on Saturday, May 4! Dress your dog in their best Rangers gear and participate in a pregame parade around the warning track. Don’t miss out on this unique event to watch the Rangers take on Toronto with your favorite furry friend! 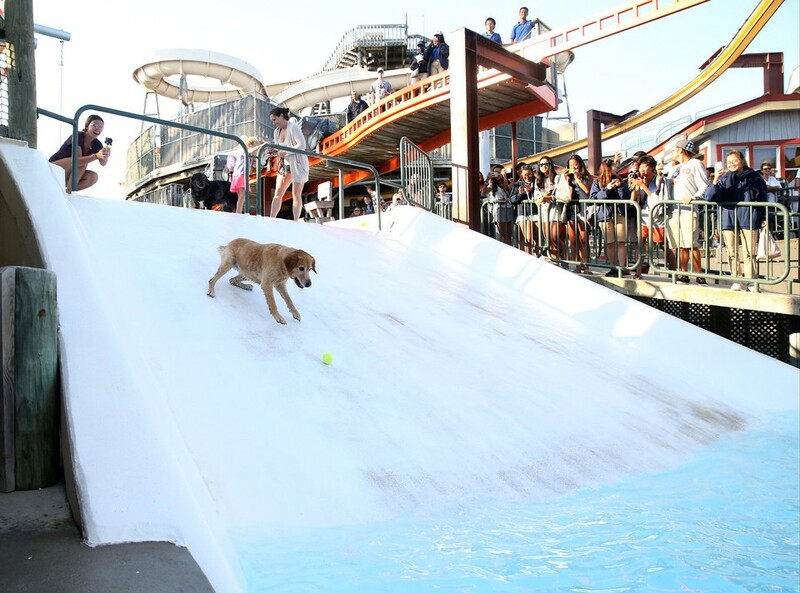 Skip the dog park and come to Nationals Park! Pups in the Park presented by Budweiser is a unique opportunity to bring your dog to a Nationals game. You and your dog will both get to enjoy the game with other dogs and dog lovers from seats in our pet-friendly outfield reserved section. All proceeds from the dog ticket sales will be donated to the Humane Rescue Alliance. There are 5Pups in the Park games in 2019: Saturday, April 27 at 4:05pm vs. San Diego Padres; Sunday, May 26 at 1:35pm vs. Miami Marlins; Thursday, June13 at 7:05pm vs. Arizona Diamondbacks; Friday, Sept.13 at 7:05pm vs. Atlanta Braves; Saturday, September 28 at 4:05pm vs. Cleveland Indians. 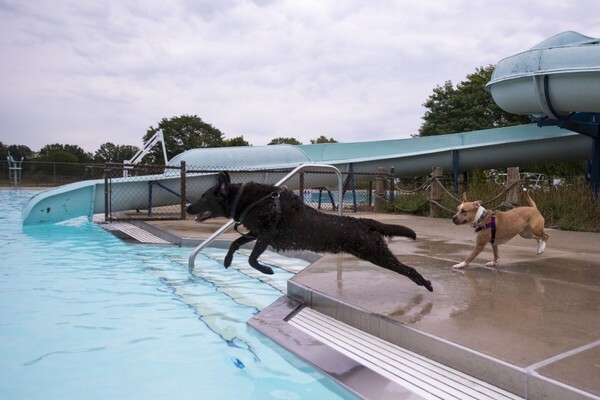 During the dog days of summer dog swim days are held at public swimming pools and water parks across the country, usually as the pools are closing for the summer and before they’re drained. 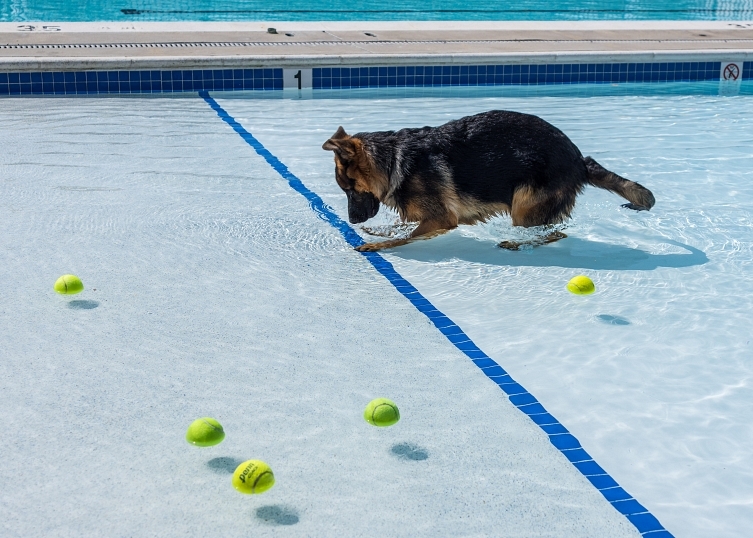 Dog Swim Days are the one time of the year when dogs are welcomed to dog paddle, fetch and play in the pool. Portsmouth, NH is pure beauty with all the New England charm and colonial homes you’d expect. It’s situated directly on the water. Woof Woof loved smelling the sea air and walking across the bridge that within a mile or two led to Maine. It’s just an hour drive away from Boston and the same from Portland, Maine. 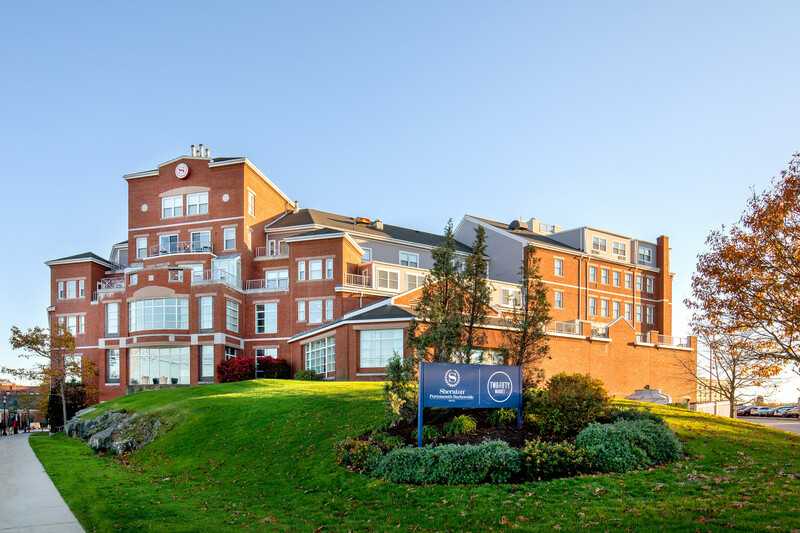 The Sheraton Harbourside hotel was just as charming as Portsmouth itself. Woof Woof had an array of room choices available to him from standard rooms to suites that are dog friendly. He was given a homemade dog treat made by the pastry chef, Lea. She offers them to all the canines staying in the hotel. When Woof Woof entered the suite he stayed in, he barely sniffed it. He didn’t look at the view. He just gave an approving this-is-home-for-a-few-days look. He alternated his room time between the bed and a comfy couch while I watched TV. With the exception of when we ordered room service, the lobby was much more interesting to him. The restaurant area is in enveloped by two curved staircases with pillars separating seating from the lobby. He loved climbing up and down the staircase. Marcia, who works in both the hotel and room service, brought Woof Woof extra slices of bacon. When he retired to bed, he was grateful for the dog bowls the hotel provides for a few sips of water. Definitely a warm place for any canine visitor. Woof Woof’s Bark is a lifestyle site dedicated to providing the best information possible to overwhelmed pet parents of dogs and cats. Whether it’s the first day or the last day of your vacation, sometimes you just need a hotel that’s close to the airport and offers everything you need for a restful stay from a shuttle to the airport to a great breakfast and a gym to workout afterwards. And of course, the warm welcome your dog or cat needs and deserves. 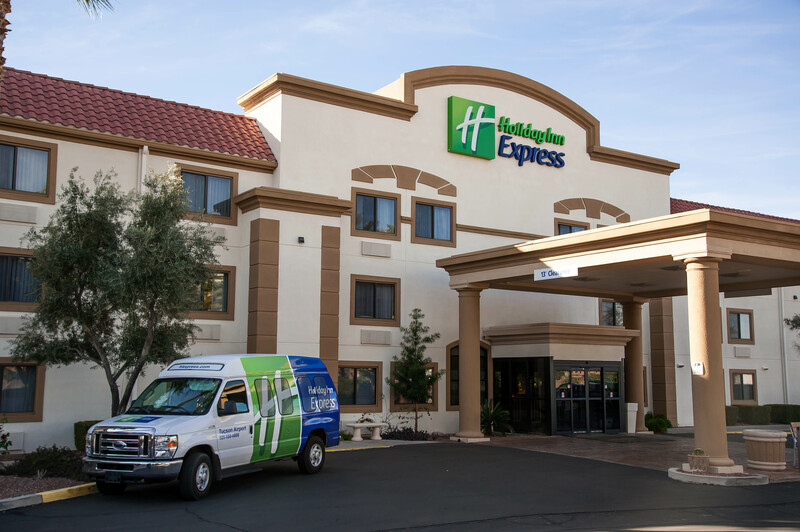 That’s exactly where we’d place the Holiday Inn Tucson Airport. It’s not a place to spend a whole vacation, but it’s a great place if you’re working at nearby offices or passing through Tucson for a day or two. 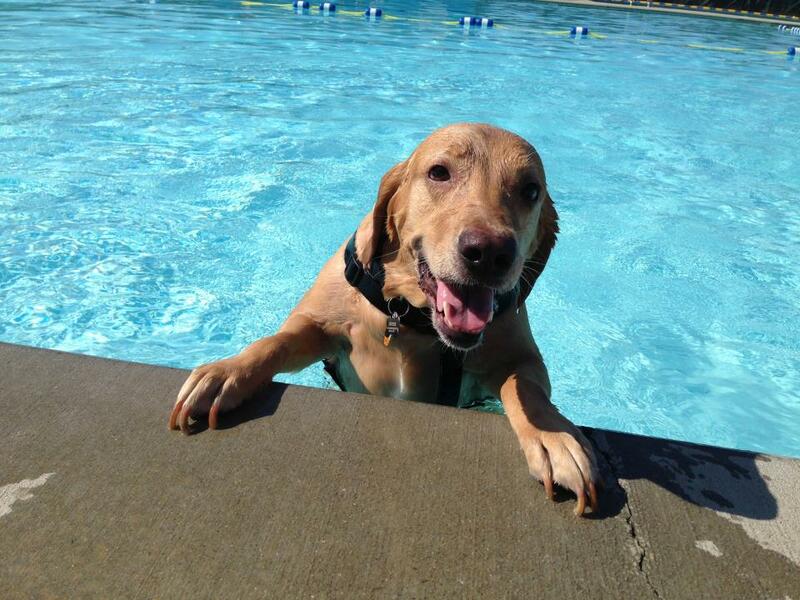 For humans, there’s a pool and hot tub. 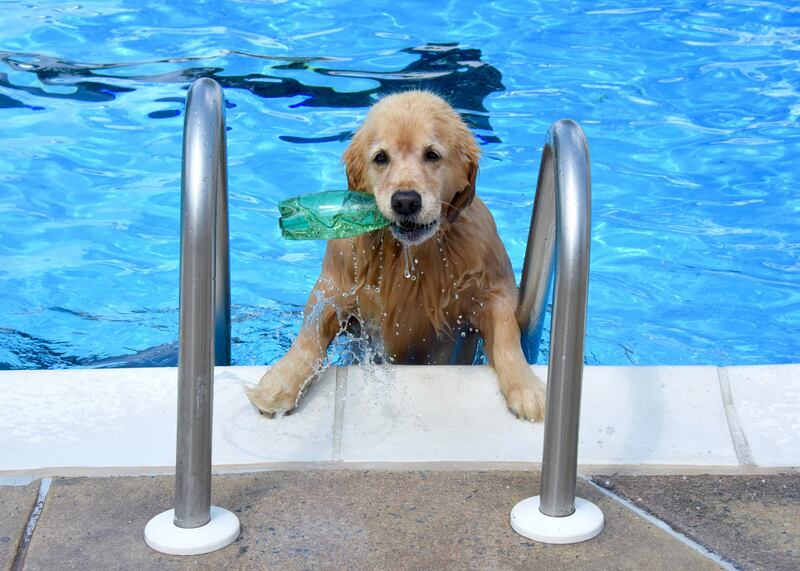 The pet fee is reasonable at $25 per pet and works for the whole stay. All pets are accepted, so you can bring your dog, cat, ferret, parakeet, etc. Woof Woof loved the free breakfast offered to all guests, and it was pretty healthy for him. He ate an egg white omelet and half a bagel. The room was comfy, but it was the staff that made his stay. He couldn’t walk the lobby without a staff member stopping to pet him. As vacation season approaches, many pet owners will have to decide between abandoning their furry friends to kennels or undertaking the significant hassles that come from making pet-friendly travel arrangements. Unfortunately, neither option is ideal. 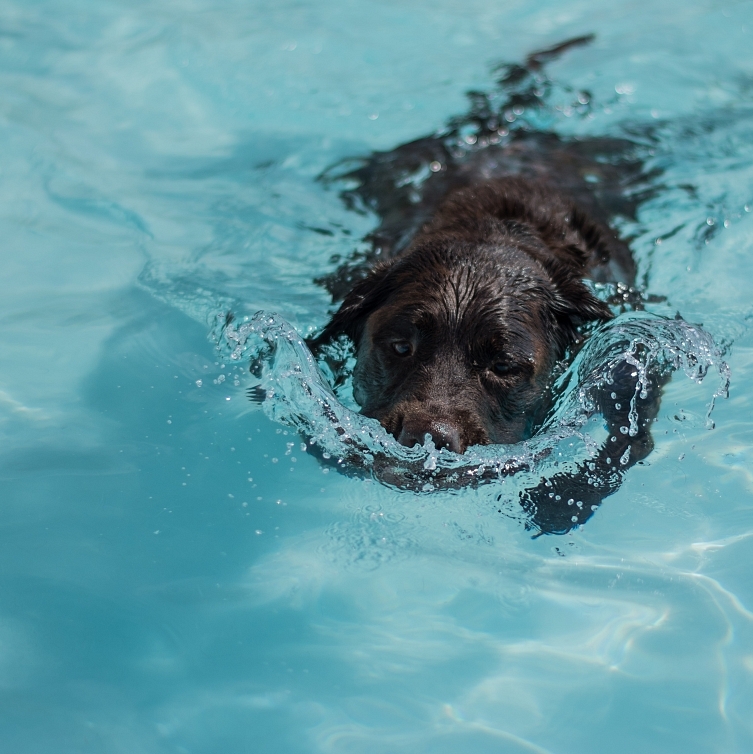 It’s never easy to find someone trustworthy to care for your beloved pet – even for short periods of time – and the high cost of kenneling only makes getaways that much more expensive. And if you decide to bring your animal along on your precious vacation, you’ll face an entirely different set of challenges. Animals don’t understand departure gates, rest stops, or damage fees. But they do understand hunger, and fear, and the inevitable call of nature and act on those impulses without fail, no matter how well they’re trained. 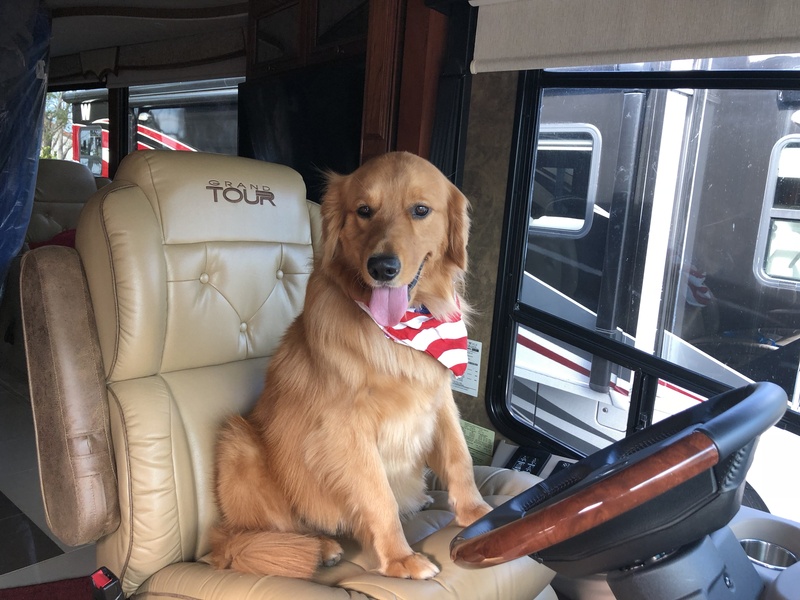 Fortunately, there’s another option that allows pet owners to travel with their fur babies free from trouble and added expense: the trusty RV. 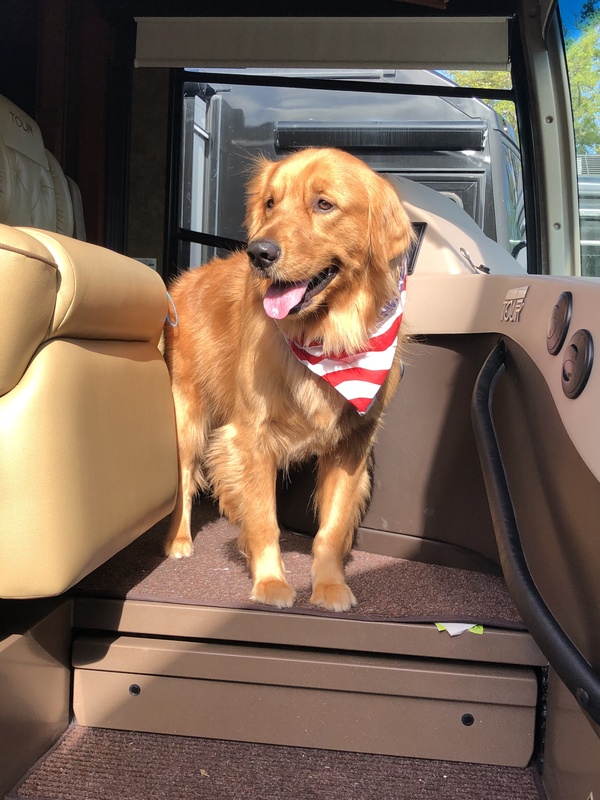 Comfortable and suitable for all passengers – Fido included – RV’s combine transportation, luxury accommodations, and entertainment into a single fun package. 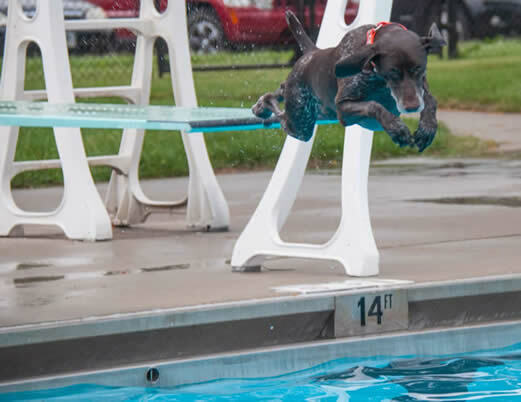 Unlike in planes, trains, or automobiles, your pets won’t be confined to a cramped kennel. Instead, they’ll have the freedom to move around, look out the window, and cuddle with their favorite humans as you watch the miles melt away. And you’ll love the freedom that comes with RVing too. Gone are the check-in and check-out times that dictate every travel move. Instead, you’ll have the freedom to set your own schedule. And after all, isn’t that what vacationing is all about? RV’s will also help make your vacations more affordable. With an RV, you travel, sleep, eat, and play in the same place. That means fewer nights in expensive hotels, more home-cooked meals, and more time enjoying your vacation. Make sure the park or campground is pet-friendly and accepts your dog’s breed (pit bulls, German Shepherds, and Rottweilers can be restricted). Food & Water: Before you depart, you need to understand how your pet handles fast-moving vehicles. Just like humans, pets can get motion sickness. While traveling, make sure to keep pets on the same diet to avoid upset stomachs. Also feed them at the same time every day to maintain consistency. This should go without saying, but be sure to always give your pet plenty of water. Collars & Leashes: No matter where you are going, keep your pet’s collar on at all times and bring multiple leashes. Some state and national parks, as well as campgrounds, have specific leash guidelines that might require your pet to be leashed at all times. You also never know how your pet will respond in an unfamiliar environment, and by always having a collar and leash on your pet, you can relax knowing they will remain under your safe supervision. 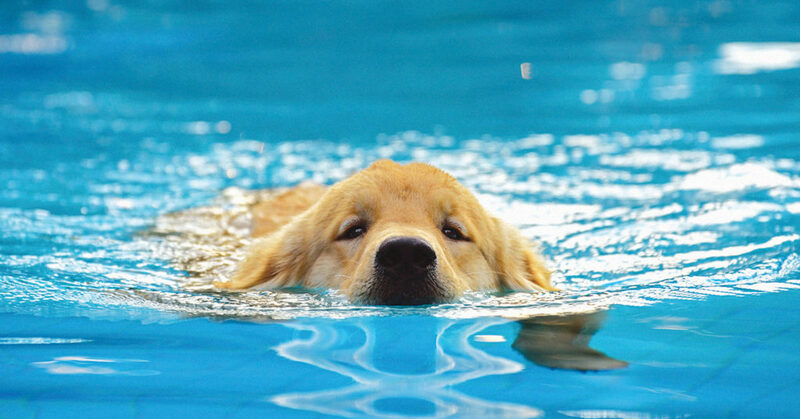 Documentation: Be sure to bring up-to-date records on your pet’s vaccinations, medical history, and registration. Some campgrounds and parks may require this information before your stay. In addition, ensure your pet has identification tags on their harness or collar. You may also consider getting your pet microchipped so you can be quickly reunited if your pet goes missing. In-Motion Safety: If you aren’t sure how your pet handles fast-moving vehicles, talk with your veterinarian about prescribing nausea and anxiety medication. 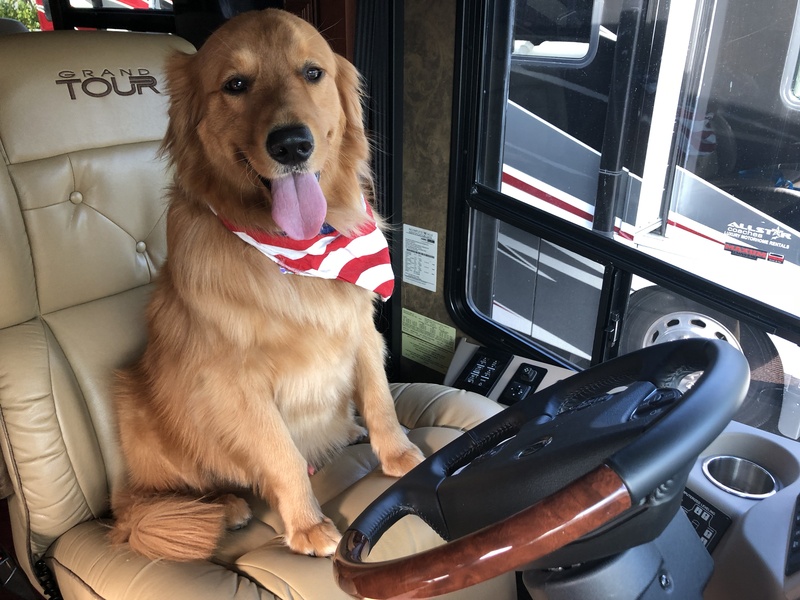 Use a crate or pet seat belt for active pets while the RV is moving. Even calm pets should be put in a safe place with blankets and padding. 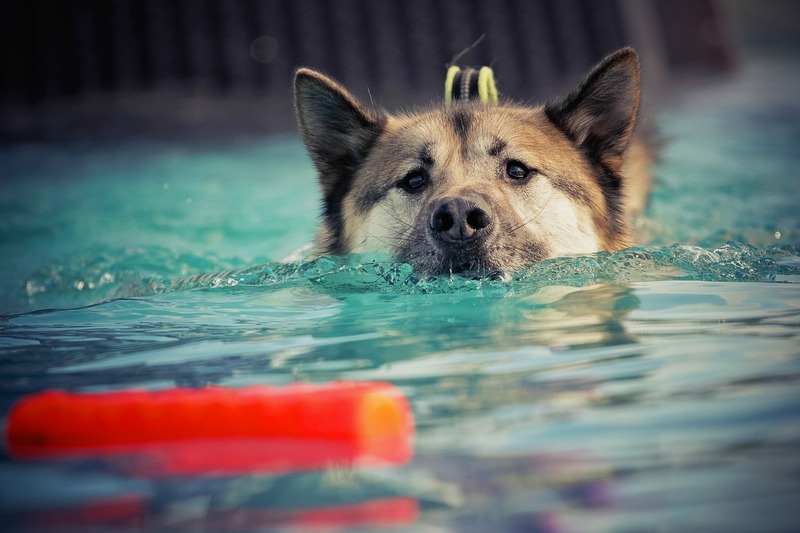 If at first your pet is showing signs of anxiety (pacing, drooling, panting), do not fret; it may take a few miles before they get comfortable in their new environment. And lastly, remember half the fun of RV travel is getting there. And you’ll never have to leave your pet home alone during vacation, ever again.